The Ospreys put in a more convincing effort this past weekend as they clinched a crucial home victory over the Worcester Warriors at the Liberty Stadium. The four tries to one, 37-22 win puts themselves in reach for the EF Energy Cup semi finals. Gavin Henson scored a nice try for the home side, but one of the moments of the match, and perhaps even the season, came from an unlikely source that is better known for the grunt work up front. As the Ospreys threw it around, flyhalf James Hook found himself in space down the right wing, with what looked to be a fairly regulation canter down field for another try. Young English prop Matt Mullan had other ideas though as he sprinted all of 50 yards to ultimately chase down and tackle Hook into touch. The covering forced Hook into tough, denying him the try, and made those at the ground and those watching live, stand up and take notice. It was of Josh Lewsey on Jean De Villiers proportions, perhaps even better. "That was a fantastic effort," said his coach, Mike Ruddock. 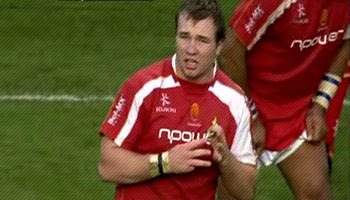 "I had a text message from an old front-row acquaintance of mine after the game, asking who the hell Matt Mullan might be. As a matter of fact, we've been talking about Matt as a potential England prop for some time now. “He's scrummaged well against Matt Stevens and Phil Vickery, and he is able to do so much more about the field, he is phenomenal. It was a fantastic effort. He made 18 tackles for us in a recent game. Not all of them like that one, mind you." Note: This footage includes a nice try scored by Sam Tuitupou too, and then shows the Mullan try-saver. We'll try get a cleaner version soon if possible. That boy has absolute wheels. What a tackle. Definately a classic. this guy is definite england material for the future, been playing well for the warriors since last season. any chance of gettin miles benjamins trys gainst bath last year? goes to show what the new age prop can do, it's becoming an increasing demand for "front row fatties" to be able to move around the park, and here is a prime example of a prop who can move. This also reminds me of Malcolm O'Kelly's try saving tackle against England in Twickenham in 2004. Any chance of getting that up? Good to see George Gregan is keeping busy with a spot of refereeing. ^ lol. At least yours wasn't filmed and shared with the world mate. I bet Hook has taken a fair ribbing for that. But why did the ref have to go to a video ref on both occasions when it was clear that the first was a try n the second wasnt! If this guy cant make the calls with confidence then he shouldnt be reffing at this level! I accept video ref is needed for close calls but refs are wasting so much time with obivious decisions. anywho, how quick is that prop!!! Been waiting for this to come on, as soon as i saw it on tv i knew it'd come up on the site. Great tackle, there's no way hook would have slowed down cos he could see him coming, that's pretty embarrassing. Great tackle by the fattie. that referees jerseys has got to be the ugliest ever to be seen on a rugby pitch! and I havent forgotten about paris... on-t: great reward for not giving up! thats tha rugby spirit! yet to see, the magnific try scored by gavin henson and the spear tackle also made in this game. Growing up playing gridiron, this is what I love about rugby. Every player (1-15) ultimately has the chance to exhibits all aspects of rugby skill. Any prop has a chance to take a corner-flag angle and make a try-saving tackle? Gridiron's roles are so regimented, nothing like this ever happens. And this video is every rugby coaches' dream for schoolboys -- every defender hustles and chases; every player with the ball must respect their opposition and not assume anything.